The Center for Teaching and Learning expands faculty development opportunities at Baruch College. Baruch College has a rich tradition of faculty development, including programs that have been led by the Bernard L. Schwartz Communication Institute and the Writing Center for the last fifteen years. The CTL builds upon this tradition, experience, and body of knowledge to augment existing structures and forge new paths for supporting faculty and students as the College strives to attain the goals articulated in its Strategic Plan. The Center for Teaching and Learning reports to the Office of the Associate Provost, Dennis Slavin, and is supported by an Advisory Board drawn from across the community. The Center for Teaching and Learning also works closely with the Zicklin Online Learning and Evaluation program, which supports experimental design of assessments of hybrid and online teaching in the Zicklin School of Business. The Center for Teaching and Learning (CTL) is dedicated to serving as a catalyst to foster the exploration of teaching and learning opportunities at Baruch College. Working in collaboration with other academic service units, the CTL focuses on facilitating the development and adaptation of various teaching and learning models, including hybrid/online delivery modes. The CTL brings together faculty from various disciplines to reflect upon pedagogical opportunities and the enabling role of technology in education. The CTL offers a variety of faculty development opportunities. The CTL hosts informal workshops and structured seminars that focus on teaching practices, course/assignment design, and educational technologies. CTL staff are also available for one-on-one consultations. If you’d like to discuss your course or other faculty development opportunities with a CTL staff member, you can drop by the CTL, give us a call (646-312-1565), or email us at ctl.baruch@cuny.edu. 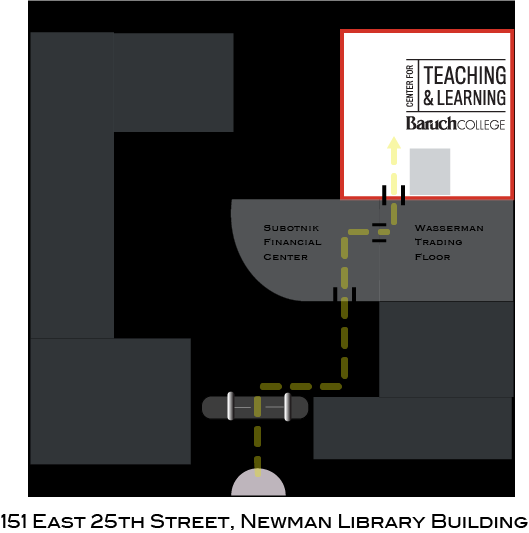 The Center for Teaching and Learning is located in the Newman Library building (151 East 25th Street) within the Subotnick Financial Center. The CTL is open Monday through Friday from 10am to 5pm. To get to the CTL, enter the Newman Library building and proceed through the turnstiles directly ahead. Make a quick right into the Subotnick Financial Center. Pass through the trading floor and follow the signs to the CTL.